Lori Elmore-Staton identifies different vegetables in the garden at the MSU Child Development and Family Studies Center. Photo by David Ammon. One in eight U.S. preschoolers is considered obese, according to the Centers for Disease Control. One-third of three- and four-year-olds and half of five-year-olds in Mississippi’s Head Start programs are considered obese or overweight, according to the Mississippi Department of Education’s Office of Healthy Schools. Overweight children have a greater risk of chronic health conditions in adulthood. Healthy eating is one way to help prevent childhood obesity.That’s why Drs. 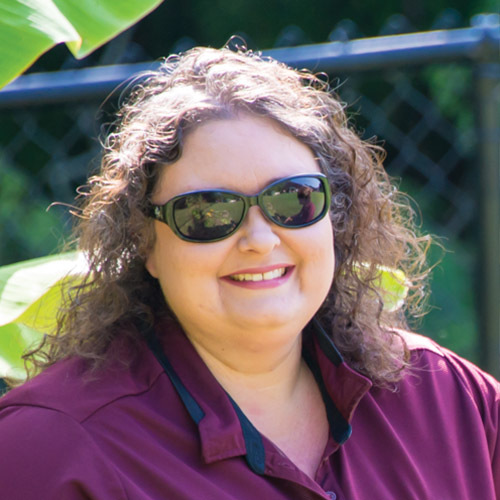 Julie Parker and Lori Elmore-Staton, researchers in the Mississippi Agricultural and Forestry Experiment Station, created a comprehensive obesity prevention program aimed at educating children, teachers and parents on how gardens can help foster healthy-eating habits. Parker and Elmore-Staton established a garden at the MSU Child Development and Family Studies Center along with vertical garden structures at the MSU Aiken Village Preschool. By participating in structured curricula centered on the garden, children were immersed in an outdoor-learning environment that went beyond teaching basic gardening skills and covered science, math, art, music, physical education and literacy. There were also opportunities to further develop social and emotional skills. “The goal was to create a space where children learned about planting, nurturing, and harvesting fruits and vegetables while participating in other educational activities integrated into the environment,” Parker said. “Previous research demonstrated that young children learned best when they were allowed to be active participants in learning. We also know that children who participated in planting and maintaining school gardens have been found to select and consume more nutritional foods,” she continued. 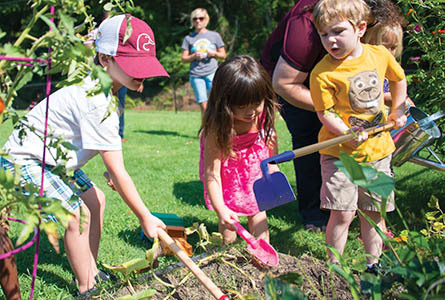 Learning gardens can help foster healthy eating habits in children. Photo by David Ammon. The children decorated used milk jugs and used them as watering cans. Large vegetable cans doubled as painted planters and musical instruments. They grew grass in the sand and water table creating a makeshift pasture for plastic barnyard animals. Children planted and watered seeds in the ground and started sprouted seeds in the classroom and watched them grow. They planted trees and made scarecrows. Older children adopted plants they took care of every day, drawing illustrations and recording plant details in a gardening journal. When it came time to harvest, Elmore­Staton said the team tried to be creative and adventurous with food, introducing less familiar dishes. “We tried to teach parents innovative ways to use fresh fruits and vegetables so we conducted a few taste tests. We prepared zucchini chips that tasted like potato chips. We cooked spaghetti using spaghetti squash instead of traditional pasta. We even whipped up cauliflower mashed potatoes, which the kids liked so much, it is now on the Center’s regular menu,” Elmore-Staton said. The taste tests were also learning experiences as children graphed charts of foods they enjoyed the most and the least. Elmore-Staton pointed out that previous research illustrated children need multiple opportunities to taste foods before they determine what they like and don’t like. “In some cases, it can take more than 17 times for a child to decide whether or not they like a certain flavor,” Staton explained. “It is important for parents to introduce various foods early on and try to embrace that early stage of discovery.” In addition to the gardens, the researchers conducted surveys and focus groups. 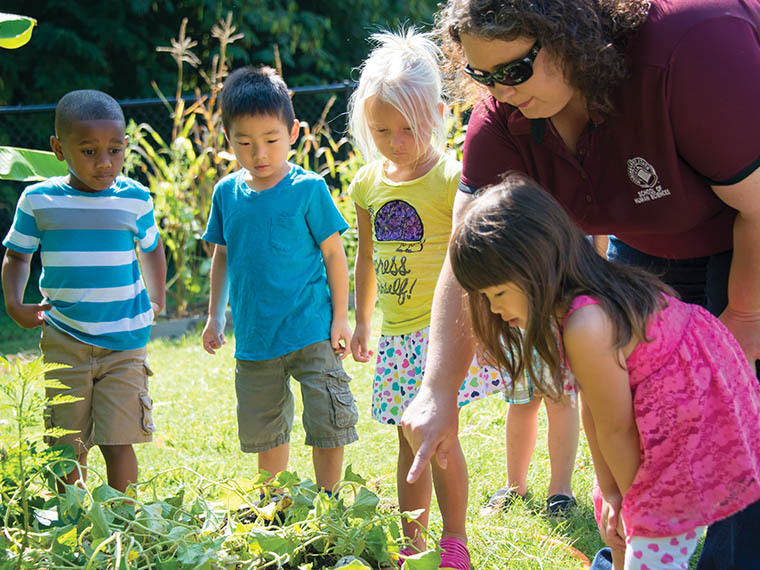 They collected nearly 100 surveys from early childhood educators across Alabama, Mississippi and Texas to assess teacher perceptions in creating a school garden. They held parent/teacher focus groups to determine ways to improve the garden program. The fruits of their labor resulted in a comprehensive manual titled, “Watch Us Grow: From Seeds to Standards,” an experiential learning project, which provided a step-by-step guide for early childhood educators interested in starting a school garden as an experiential outdoor learning environment. The project placed second in the Southeastern Early Childhood Association’s Exemplary Outdoor Classroom Contest in the category of creating an outdoor classroom on a shoestring budget. Collaborators included Gaea Hock, assistant professor in the School of Human Sciences; Elizabeth Payne, assistant professor in the Department of Landscape Architecture; Jacob Gines, AIAA, assistant professor in the College of Architecture Art + Design; and Carol Jones, director of Aiken Village in the College of Education. In addition to the Mississippi Agricultural and Forestry Experiment Station, W.K. Kellogg Foundation, the MSU Extension Service, the MSU Office of Research and Economic Development and the School of Human Sciences in the College of Agriculture and Life Sciences provided critical support as well. Focus: My research is focused on child well-being, in-service teacher professional development, and inclusion in early childhood. Passion At Work: My areas of interest and research link together, in that, childhood obesity rates in Mississippi are some of the highest in the nation and a significant percentage of young children in Mississippi are born with at-risk conditions, often compromising their growth and development. These issues not only affect the family, but carry over to the academic or early childhood experience. 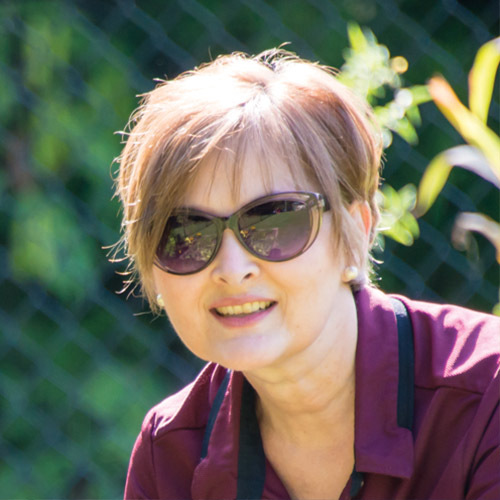 My research focuses on assisting early childhood educators with enhancing their skills to teach children about overall physical health, emotional well-being, and creating community classrooms that are inclusive for all children. Focus: My work focuses on finding the risk and protective factors that contribute to the developmental trajectories of children across multiple domains (i.e., cognitive, social, emotional, physical). My research places a special emphasis on sleep and emotion regulation of children and how these regulatory processes interact with family and the greater sociocultural environment to predict child health and adjustment. Passion At Work: I want to find ways in which to improve the lives of families and children so that everyone has the opportunity for a successful, happy life.